Titanium cable rings are a recent development in titanium jewelry sector and they represent a new demonstration of titanium metal unique properties that can make a difference in its claim to become one of the traditional metals in the jewelry field. Any metal and I’m referring at the traditional jewelry metals now, such as gold and silver can be drawn into a wire and subsequently be woven into a cable. In fact, before more advanced metallurgical techniques were used, metal wires of different diameters were a good alternative for jewelry makes. 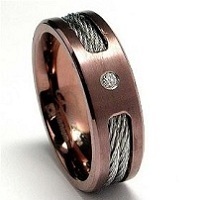 In fact, at a first glance titanium wire doesn’t seem such a bright idea for making a jewelry item. Sure, it is possible to draw titanium into a round strip of metal, but titanium is much harder to draw than gold or silver, so it would seem that this is just an expensive and unnecessary mean to produce, in the end, an accessory. Just as a thought, the whole industry sector is built on premises such as “expensive” and “unnecessary”. Compared to digging miles in Earth’s womb to retrieve some old shiny coal pieces (I’m talking about diamonds), a titanium cable ring is a mere walk in a park. As in everything else in this universe, the biggest flaw is also the biggest advantage. Drawing of the titanium into wire is difficult because titanium metal is harder and more durable that its counterparts – gold and silver. The resulting product is obviously also far more hard and durable than any other form those two metals can achieve through whatever production process known to man – or at least to those men involved in jewelry sector. Yet, surprisingly, this advantage is not being put to use by industry professionals. Or at least not in the sense I would. Vut I'm just an engineer and I may be lacking the artistic perspective this artisan share. 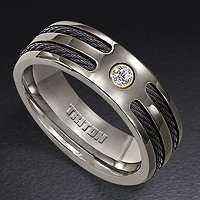 The common titanium cable ring that is available at jewelry retailers is actually not made of titanium wire – except some notable exceptions, such as this model designed by Edward Mirell. Instead, most titanium cable rings manufactured and marketed as such, are in fact pure titanium rings with inlays of titanium cable. Obviously, other than the aesthetic effect, the use of titanium cables in such ring has no other practical advantages, regarding resistance and durability. In some cases the cables are not made out of titanium, but are rather simple steel cables. It’s true that this effect can be quite stunning in some cases and I have the pictures to prove that. I often wonder what would possibly be the use of someone describing with accurate detail a class of jewelry, even if we’re talking about the impressive titanium cable rings. After all, jewelry was designed to be a visual product, meant to enlighten the eye, rather than the mind. 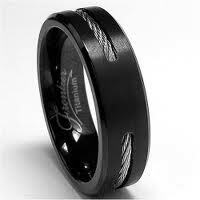 And how could one possibly put into words this unusual chocolate tint this ring has, for example? How could anyone can undestand what a "chocolate ring" is without actually seeing it? A picture is worth a thousand words. And is also more efficient. You could write whole pages if you want to be really thorough, just for a simple ring. Well, not for a simple one. But for an intricate one, with carvings, with diamond inlays, with anodizing effects, one could spent days and still not be able to grasp the magnitute obtained just by showing a simple picture. This is especially true when talking about jewelry. Delight yourself with the pictures of unique titanium rings made out of wire titanium.